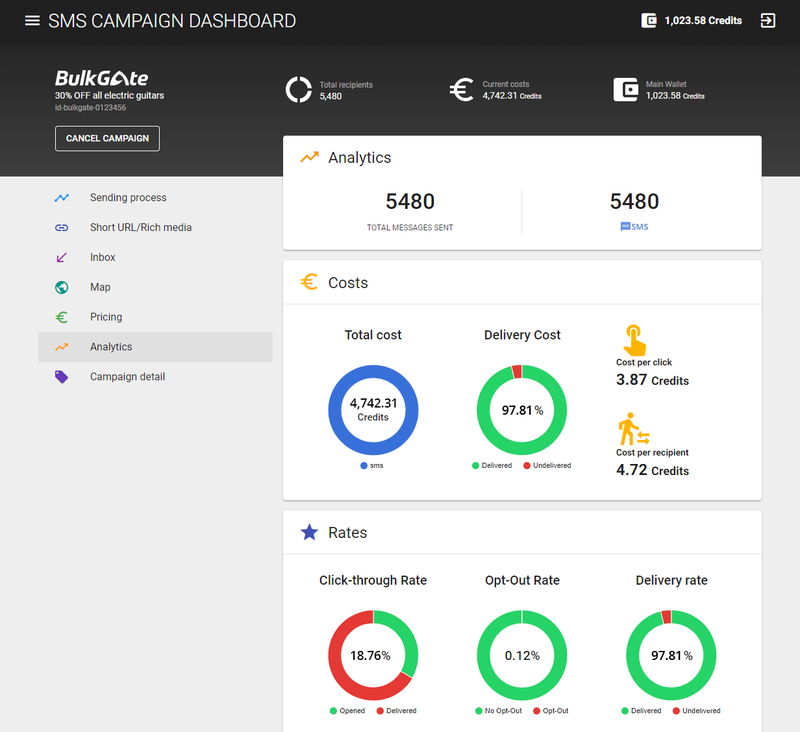 How to analyze SMS campaign success with BulkGate? Analyzing marketing campaign success is a very important task for every marketer. You need to see whether expended costs actually brought the desired effect in positive ROI (return on investment) or other metrics, and that the campaign served its purpose. Bulk SMS campaigns are no exception. There are some essential metrics that can help you see whether your campaign was successful or not. These essential metrics will also give you feedback for your next SMS campaign as they show what is working and what is not. The delivery rate says how many of your messages reached or did not reach the recipients of your contact list. Before the campaign is sent we filter out DND (do not disturb) and blacklisted numbers. We save you some costs as you don’t pay for these messages. The delivery rate is then calculated only from those numbers to which the campaign message was really sent. Although the delivery rate is usually above 90%, it is important to note that it is influenced by variety of factors. These factors can be: the quality of the list of numbers, telecommunications networks and carriers etc. You can find this rate in the Analytics section of the campaign dashboard. The opt-out rate is a very important indicator of your targeting success and message content. It represents the number of recipients who opted-out after receiving your campaign. The recipients can unsubscribe from your campaigns for various reasons. It may be because of incorrect targeting of target groups, the content of your message didn’t bring any value, bad timing of the campaign, recipients no longer find your marketing content valuable, you text them too much etc. You should always aim for the lowest opt-out rate as possible. Although there is usually someone who will subscribe from your campaigns, good opt-out rate is below 0.5%. It is important to test your campaign on yourself before you send it to the thousands of people in your contact list. You can find issues with your message that could increase the opt-out rate. The campaign dashboard also shows you how the recipients unsubscribed from your campaign. Recipient can type STOP SMS or use our web opt-out. When you include a link in your campaign that has been shortened by BulkGate URL shortener, you can then analyze the click-through rate among other valuable data. The click-through rate (CTR) represents the percentage of people who were interested in your message and clicked on the link that redirected them on your web page. The CTR in our Analytics is a number of unique clicks where 1 person is represented by max 1 click, even though he/she clicked more times. The average CTR in SMS marketing is 19%, which is the highest of advertising mediums. 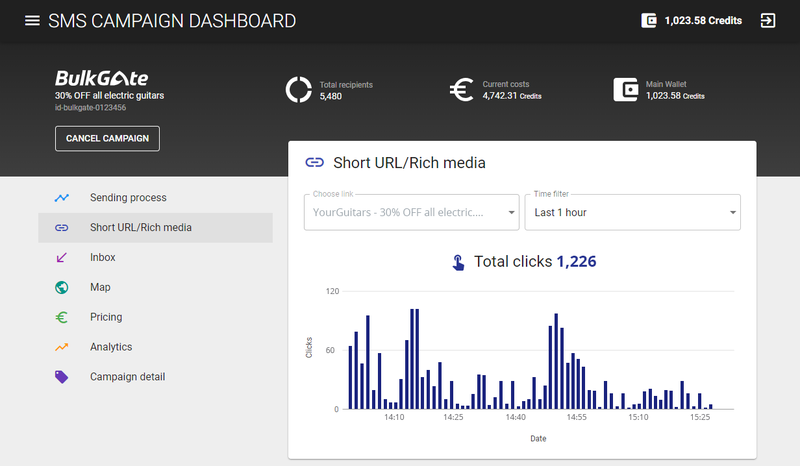 If you are interested when people clicked on the link or links, what was the total number of clicks (some people could have clicked more than once), and other valuable statistics, you can go to the Short URL section in the campaign dashboard. These data will provide you additional picture about your recipients that can be subsequently used in the next campaign. The conversion rate indicates the percentage of recipients who took a desirable action. Depending on what the purpose of your campaign is, this can be a purchase of a product or service, subscription to newsletters, account creation, phone call, visiting your website etc. SMS marketing has astonishing conversion rates of up to 45%. This can lead to very impressive ROI, which is the next metric I’m going to talk about. If you don’t want calculate your campaign conversion rate manually (CR=number of conversions / number of website visitors), you can use Google’s campign URL builder in connection with your Google Analytics account. You still need to shorten long URL on BulkGate however in order to get CTR. We’re currently working on a seamless connection between Google analytics and BulkGate. This will mean an easier analysis of the conversion rate. When you create Smart SMS campaign the conversion rate is automatically calculated in the campaign dashboard if you activate the order form. Return on investment (ROI) is probably the most important metric. It measures the efficiency of an investment, in our case the efficiency of marketing investment (SMS campaign). As I wrote above, conversion rates for SMS campaigns are really high which can be then reflected in the ROI. Every marketer wants to see how big the ROI of a campaign is. It can be, again, calculated manually (ROI=((amount gain – amount spent) / amount spent) x 100), or you use Google analytics as with the previous metric. As with the conversion rate, we’re working on a seamless solution for you. I’ll describe how to set up your Google Analytics account in order to get ROI in another blog post. Our campaign dashboard gives you other valuable metrics and data that help you gain a better picture about the outcomes of your SMS campaign. This metric is associated with the CTR and the costs of the campaign. It tells you how much you pay for every single click that takes the person to your website. The more clicks the link gets the lower the cost per click, which results in a more efficient campaign. This metric takes into account all the clicks on your link. So if a person clicks 5 times on the same link it will influence the cost per click. Cost per recipient almost identical as the cost per click metric. However, it doesn’t record when a recipient clicks on a link more than once. 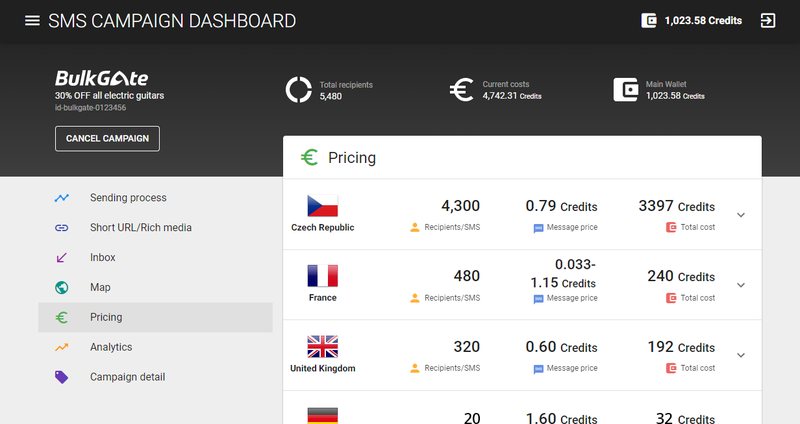 In the BulkGate campaign dashboard, you can also see more detailed list of costs according to individual countries. This can give you a better overview of where your messages went, what were the costs according to operators etc. The above mentioned list of metrics is really useful for everyone who tries to analyze the efficiency of their SMS campaign and optimize the upcoming ones. Register on BulkGate Portal and start building and analyzing your own campaigns.